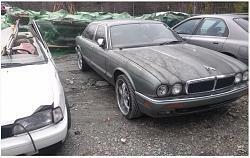 LKQ in Greensboro, North Carolina just placed a 1995 XJ12 in their yard on March 2nd. Since these cars are rare, I thought I'd get the word out. I have no certain idea why it is the yard other than a minor fender bender, or if it ran when delivered. But other than that, the body seems solid with no other major dents or rust. Someone had already removed all the Jaguar emblems and leaper, even on the steering wheel by the time I got there today at noon. The interior is in fair shape, and mostly intact so far. No one has disassembled dash instrumentation or console yet, and that all looks pretty good as of today. The leather seats, really anything leather, and drivers door panel are pretty rough, as is anything fabric, but all the wood is in remarkably good shape although as normal is cracked, but I understand can be refinished. The seat back tray tables are also intact and good shape. I took portions of the rear door panels, but the wood is placed neatly on the rear package shelf. The rest is all still in place. I plan to go back up there next weekend to pull the oil cooler( Please don't take that, I've been looking for one! ), front bumper stainless cap/trim, and maybe the drivers seat rails/rack & radio. If someone needs something specific to an XJ12 let me know. Of course that doesn't mean the engine ....although I would if I could! Does anyone know if the throttle body TPS is interchangeable with the XJ6/XJR TPS? Any other hard to find engine parts that cross-reference that I should look for next weekend as spares? Last edited by al_roethlisberger; 03-06-2016 at 02:39 PM. Weren't you looking for a chrome grille? A little sad....knowing that it was once the $75,000 flagship of the fleet! A really super ambitious person would pull the engine, trans, and all associated bits and electronics. I wouldn't be that person but it seems a shame to let 'em go to waste, doesn't it? Anyway, I was going to pull the drivers turn signal lamp but it's cracked. The others are pretty oxidized, but not sure if they are cracked or not. The passenger low beam headlight lens is shattered, but the other three look OK. It's interesting that it always seems to be the passenger low beam lens that separates, as mine did. I'm in the process of replacing all of mine with X308 headlights now though. Yeah, I know... I thought the same thing. Sad. I was worried that I'd miss out if I waited until next weekend, so I went back to Greensboro today (1 hour drive) and the car has already been picked at some more. The passenger dash knee bolster (early 95, no glove box) was pulled off and various wiring yanked out from under the dash. It appears someone had some sort of mobile phone setup at one point that a picker was interested in. While I was under there I took the ECU and TCM since it was then easy picking. Someone also pulled the wood surround off from the center dash vent, and I couldn't find it. So I guess that's gone. But hey, the "V12" wood cover on the passenger airbag is still there and in good shape, not even cracked as far as I could tell. I took part of the console apart to see if the radio/clock/AC control mounting frame was intact, but alas at least one of the mounting tabs/ears were broken... aren't they always? The ski slope wood finish was a shattered mess. I also took the interior b-pillar trim apart to get the chrome seatbelt adjuster trim off. Other than that, someone had been digging around the engine bay, but no major parts were gone. It appears they may have taken some of the throttle linkage, but not much else. Also used the car as a learning opportunity on how to take the front bumper off and remove the stainless trim. Lots of fun. When the weather is mild like this (60F) I really could spend all day in a wrecking yard checking out the cars and taking stuff apart It is $2 well spent, sortof like an amusement park entry fee! So unless someone needs something really specific/important, I don't plan to head back up there this weekend since I've got what I needed and it's a long drive. BUT if someone here needs something special from an XJ12, let me know and perhaps I can get up there Sunday or the following weekend. Thanks Al, that's very generous of you. Luckily, I can't think of anything so important that I am missing now. Plus I had the donor car up until last year, for body parts. Ironically, that car had a near perfect console frame! I used it in the XJ6, as that one was crumbling. I see the throttle linkage off to the side, and the engine cover is on backwards. That cover is fairly valuable. It dresses up the engine without covering too much! It is also used on the 94-95 XJS V12. The coolant reservoir is the same in all X300 models, would be worth having a spare (as I do). Those aftermarket wheels and tires could be money because they fit a Jag! Sad to see as always, but there are many parts that will live on in other vehicles, like yours. Oil cooler: nice find. Last edited by SleekJag12; 03-08-2016 at 01:33 AM. Al, if you didn't know yet, the TPS is different between the XJ12 (LNA1660AA) and XJ6/XJR (JLM12074). Which gets me to thinking... it would be nice to have a spare TPS for my car! The parts diagram shows an "idle switch" for the V12, on the throttle linkage. I'm not familiar with that. What's that for, Doug? Yep, I could tell they were different when I took the TPS off of the XJ12. I put it back in the cabin of the car after I realized I didn't need it. If I go back, I'll see if it is still there. As an aside, the XJ12 TPS is pretty cheap at around $100 new aftermarket, unlike the XJR which is stratosphericly expensive. That's why I went ahead and left the XJ12 TPS there, as it isn't unobtanium. Not sure. I never had the opportunity or need to noodle around with X300/V12 engine management stuff. Perhaps one day I'll own one ...and my hand will be forced . 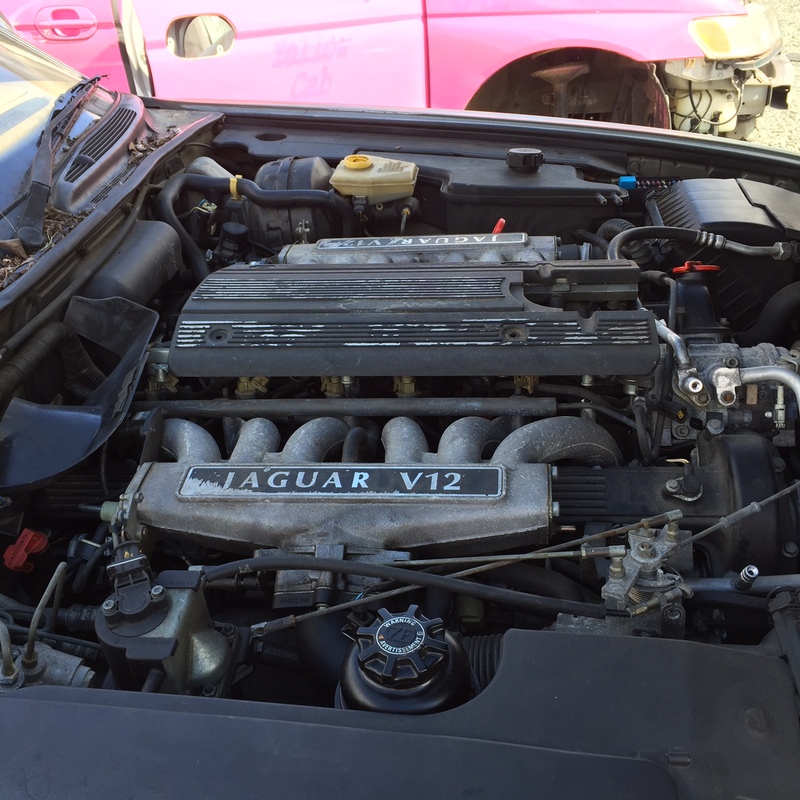 The 89-up XJSs with a 5.3 and Marelli ignition used an idle switch that closed (or perhaps opened...I forget) when the throttle was at idle position. It changed the fueling map or timing map a bit. As far as I can tell with my '96, that's the case. The micro switch is built into the TPS, and is used to trigger Idle Speed control, an Ignition timing during idle. I'm almost certain this car has the premium audio system, in which case the rear-deck mounted subwoofer is very hard to find. It's a dual-voice coil setup and very very tough to find a replacement for. Also it'll have the H/K amplifier and CD-Changer in the trunk. Power steering and A/C hoses, and Radiator & Condenser are unique to X305s. If anyone is visiting this car and could pull a couple parts, please PM me. I'm looking for the Compressor to Condenser A/C hose, the small plastic hooks which fasten the rear sunshades to the headliner. Not sure if '95s had it as standard like my '96. The hooks are held on by one torx screw. Nice find Al, they're only going to get harder and harder to come by. Less than 200 in the US for '96. That oil cooler was a good find, mine seems to have the smallest leak at the quick connect coupling. PS: I never thought it would come to this, but I even have lists going in my phone for XJ40 and X300s, when I stumble on them at self-pull junkyards. You see the car in front of you, but there are so many things you can forget while you're there. Little screws and bolts are my favorite; I always seem to smuggle at least a few out in my tool bag each time I go. Shhhh! PPS: These pick and pull places are kinda fun. I scored a beautiful, complete set of X300 headlamps without any broken brackets and the glass is UNUSUALLY clear. The cashier was ringing me up (I also pulled the power antenna and the spare 20-spoke wheel) and said "Boy, you're already over $125 in headlamps alone..." to which I said "If you can pop those lamps out of their sockets without breaking them, then I'll call it 4 headlamps." Needless to say, he rang it up as two composite headlamps instead ($50)! Last edited by NTL1991; 03-19-2016 at 08:43 PM. The ECU and TCM are still available, would hate to send these to the recycle bin. Rear brake pads on 2003 S type. 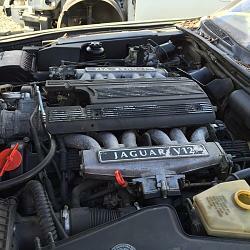 Jaguar XJ Up For Auction - Warning Signs - Stay Away?